During most of the years J. C. Watts was in Congress, he was the only African American Republican in the House of Representatives. He was also one of the few African American House members from a district that did not include a majority of black voters. Watts was a darling of the conservative Republicans who controlled the House during his tenure in Congress. They chose him to be the “Chairman of the Republican Conference” during the last four years he was in office; this position made Watts fourth-ranked among the House Republican leadership. 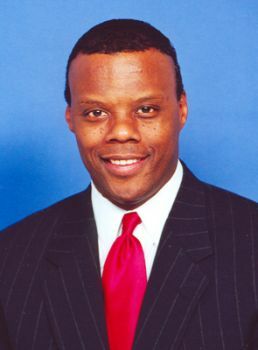 Watts refused to join the Congressional Black Caucus, an all-Democratic body often at odds with his political philosophy and the legislation he sponsored or supported. J.C. Watts and Chriss Anne Winston, What Color is a Conservative? My Life in Politics (New York: HarperCollins, 2002); Chris Casteel, “Lawmakers Say Goodbye, for Now—Watts Still Uncertain About Future Plan,” Daily Oklahoman, December 1, 2002; Alton Hornsby, Jr., and Angela M. Hornsby, “Watts, Julius Caesar, Jr. (J.C.),” in “From the Grassroots”: Profiles of Contemporary African American Leaders (Montgomery, Alabama: E-BookTime, LLC, 2006).